You may be able to avoid banning a member of your Ning network by reaching out to him or her via private messages first. You can explain why the member’s actions or posted content could lead you to ban him or her. However, this may not work. Some people clearly don’t care about you or your network: They want promote their scam or spam your members promoting their product without your consent. 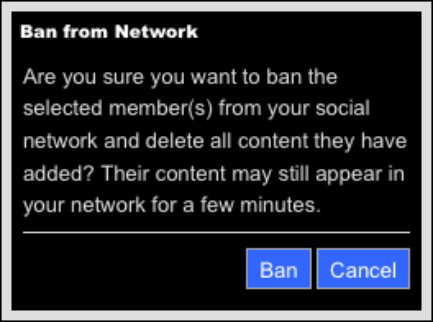 Through the Members management page: Check the box next to the member you want to ban, then click the Actions drop-down list and select Ban from Network. Ning then asks you to confirm your decision; click the Ban button. Through the member’s profile page: Click the Ban Member link next to the member’s photo. Banning a member presents you with a confirmation window. To proceed with the ban, click the Ban button. To backpedal on the ban, click the Cancel button. When the member is banned, the profile page is no longer visible to others, and all contributions the member made to the network (content added, comments left on other members’ walls, and so on) are deleted. If a banned member tries to sign into the network, he or she sees a page that explains he or she has been banned from the network. The same page gives the member an opportunity to contact you. This typically results in a variation of the “Why was I banned?” message, which you can expect to hit your inbox a short while after you click the Ban button. Click the Banned tab above the list of members. Check the box next to the name of the member from whom you want to remove the ban. Click the Remove Ban button.